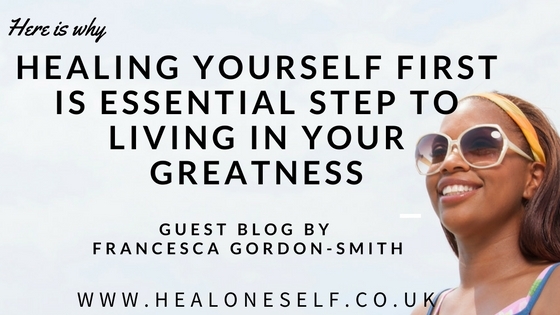 Hello fellow passangers on this life journey, this is a guest blog by lovely Francesca Gordon-Smith who shares her thoughts on why healing ourselves first is essential to Living in Your Greatness. It is something that resonates with me, a journey I had to take, and it is what I too teach all of my clients who wish to break free from the corporate world and become entrepreneurs, coaches, healers, etc. I trust you will enjoy as much as I did, here it goes…. The relationships we have with others really do determine the quality of our lives. Imagine for a moment someone just like you; she has a big argument over nothing with her partner just before leaving for work. She gets to work and the same thing happens again; she has a disagreement with a colleague and finds herself in an awful mood; she experiences negative repeated thoughts, such as “They are so disrespectful”, “They are so wrong”. She considers breaking up with her partner and leaving her job; it is all just too unbearable.